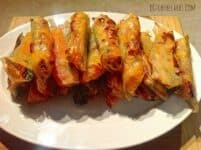 Gluten Free Spring Rolls - low carb and delicious. UPDATE :: This recipe has been improved and now includes a quick coking video. Watch it here. I made these while we were away, so I unfortunately couldn’t add a lot of exotic flavours or fresh herbs as very little was available where we were, but I cannot tell you how much my children loved these. So crunchy, tasty, healthy and full of vegetables. This was a very early recipe I made when we first went low carb and we were away on holiday. If I were to make them now, I would use wilted cabbage leaves instead to make them even lower in carbs. I would still make some rice paper rolls for the children’s lunch boxes, because they are sturdy enough to survive their lunch boxes. They are great as a dinner, snack, appetiser, school lunch boxes. Fill them with your favourite vegetables. You can also steam them or use salad ingredients inside and not even cook the rice papers, but personally, I like the crunchy texture of baked ones. 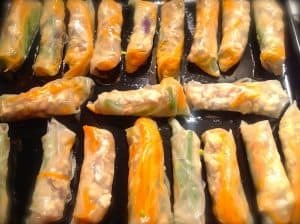 Wheat free, gluten free, low carb spring rolls. Fry the onion and garlic in olive oil until cooked but not browned. Add the chicken mince and any other flavourings. Stir while heating until the chicken is thoroughly cooked. Set aside. The rice papers are hard and need soaking in a bowl of warm water for about 15 seconds to allow them to be soft enough to roll up. I tend to soak 1 or 2 at a time. If they are left in the warm water too long, then the papers will become too soft and tear as you assemble the spring rolls. Line everything up on the bench to create a production line. Have the oven up to temperature and the baking tray ready with a generous amount of extra virgin olive oil in it. On a chopping board, place 1 soaked rice paper, add a small spoonful of the chicken mixture then the vegetables. Fold the bottom of the rice paper to cover the mixture, roll in the sides, then roll all the way up. Place on the baking tray. Roll each spring roll in the olive oil to thoroughly coat each roll. This really makes them go lovely and crisp. Repeat the above until all the mixture is used up. At the end you may have been left over with too much chicken or too many vegetables, so just make a few spring rolls with whatever you have left over. Bake at 180C for 10 minutes, turn each spring roll over with kitchen tongs, then bake for a further 10 minutes. To make these with shrimp do you precook the shrimp or is the oven crisping enough to cook through? Also do you chop them as well? Sounds wonderful! I’m a “better safe than sorry” type of gal when it comes to cooked meat. I would give the shrimps a quick stir fry to ensure they are coked before rolling up with the other fillings and baking in the oven. There is an updated version of this recipe here, and a quick video too. Like with all of Libby’s recipes I try, I read through all the comments and have read a lot of people having trouble with the rice papers tearing. 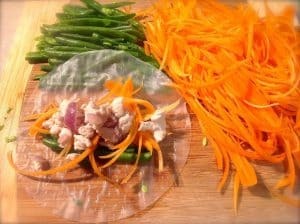 One of the reasons I wanted to try this recipe is because I grew to love rice papers working in Asian restaurants making Vietnamese rice paper rolls. At one point I was making batches of them daily. So for anyone who is interested, this is my method for using rice papers without them breaking. Along with your rice papers and large bowl of warm water, you need a large plastic dinner plate like the kind kids eat off or you have at barbecues. Take a rice paper and PASS it through the water. DO NOT SOAK! Pass the rice paper slowly through the water, in one side of the bowl and out the other. The rice paper will still feel hard, not soft! Don’t worry, it will continue to soften out of the water. Place on the plastic plate. The rice paper will kind of stick to the plate a little which helps you work with it better. Place your fillings in the centre of the rice paper. Fold the bottom up and the top down. Don’t worry if it’s not too tight, the last fold will tighten it up. Turn the plate so that the right side is facing you, fold it over, tuck in and then roll tightly. Do not handle the rice papers anymore than necessary, the more you handle them, the easier they will break. Place on your baking tray. Now for this recipe, I did have two rice papers break. My mince mixture had some liquid in it which was softening up the rice papers too much when I put the meat on and causing some tears. I ended up draining the liquid off and this helped a lot. Also, the tighter you roll these, the less likely they are to break when you roll them in the oil and turn them in the oven. One of them in the oven did burst almost completely when I turned it. If this happens, don’t handle the roll any further. Just gather any meat that has fallen out to the sides and leave it alone. Mine crisped up in the oven so much that in the end it all stuck together and held perfectly, even though it wasn’t as pretty as the others. If your spring rolls aren’t very crispy, just bake them longer. Mine took about 30 mins altogether to get properly crisp and they could have been baked even more. A further tip if they are breaking a lot is to try using meat diced small rather than mince. It will be easier to assemble, shape and roll tightly. I also noticed some people commenting that these were not really low carb. When I first looked at this recipe I’ll admit I thought the same. But there are a few tricks I used to reduce the carbs. Firstly I subbed the carrot and green beans for Chinese cabbage and shredded bok choy. Carrots are too high carb for me and I prefer Asian greens to green beans. This alone reduced the carbs by a lot. Secondly, since most of the carbs are in the rice papers themselves, I simply made my spring rolls bigger than the ones in the photo so that I had the same amount of filling overall but used a lot less rice papers. Thanks to Libby’s website my appetite is very well regulated and under control, so all it took was TWO of these spring rolls to leave me not just full, but absolutely stuffed! This makes a very low carb meal. Wow. Just make these. Delicious! Fried some and over baked the others. All delicious. Preferred the crunch of the fried version but oven still yummy. Husband just finished the last of them off! One batch all eaten in a sitting. I I made these amazing gluten-free spring rolls last night loved them. I used the pandaroo Vietnamese rice papers brought from the local supermarket. Seen as I am living on the road and don’t have a oven I decided to try frying them in a pan. I used coconut oil and they were amazing didn’t fall apart and tasted great. Thanks for the great recipe will be doing fruit one’s next week :). A good idea with fruit, a ready made fruit pie! Advice needed, made them with strawberry jam with chia seeds. Turned out a little soggie. Too much jam? Which ones did you buy? Mine say 13 carbs. Sorry I can’t remember and don’t have them in my cupboard right now. I buy the small ones and check if the carb values are per sheet or per serving. Spring roll spring roll wrappers are all very high in carb, can you find out the brand you used? I can’t find any low carb ones online… Thanks! Great recipe!! Most appear to be high in carbs per 100g but if you see how much is in each rice paper, it is quite a small amount. You can use cabbage leaves instead if you really need your carbs to be lower than in the recipe. Then you really can’t call this recipe low carb then right? These are not low carb based on the wrappers you recommend, which are 41 grams of carbs. Please adjust your macros for the recipe, it’s misleading. mine keep breaking when I got to turn them even when covered in olive oil….any suggestions on keeping them in tact? Are you soaking them too long in water? Line the baking tray with baking paper? Turning them too soon or too late? What a great idea using rice paper. I imagine they’re a bit delicate to work with, but they’re so ridiculously thin that there’s not much there in the way of carbs. I’ll definitely have to give this try. These are a keeper. I made mine with leftover chicken, and onion, carrots and cabbage that I lightly sautéed, salt, pepper and garlic powder. Delicious, now my kids ask for them everyday. I would find these at an Asian market.. Vs regular grocery store? I buy mine at my regular supermarket, near the Asian cooking aisle with rice, sauces, etc. Are rice papers the same as wonton wrappers? I’ve done a quick search on wonton wrappers and it appears they are made from wheat flour, so no. Rice papers are just made from rice and are incredibly this so are low in carbs. My spring rolls really got stuck to the pan… any tips for the future? Would really appreciate it! I put quite a bit of oil in the baking tray then roll them. Also ensure you don’t leave the rice papers in the water for longer than a couple of seconds otherwise they go soggy and won’t go crispy. I soaked them and removed them while still “thick/crispy” feeling, but pliable enough to gently roll (about 20 seconds in lukewarm water). I rolled them in oil. Then I put them in an oiled pan. When I tried to gently roll them over to crisp the other side, they caught and tore on every utensils I used: tongs, spoon, spatula. They were only crispy, a bit, on one side, and were a huge mess to eat. Where did I go wrong?? I’m pretty sure 20 seconds is too long to be soaking them for. I dip each rice paper in the warm water for 3-5 seconds, put them damp on the chopping board and place the ingredients on. Once I feel the rice paper has softened enough with the water that was left on them, I roll them up. Also ensure you have enough oil on the baking tray to turn them in. Maybe use a non stick liner or baking paper too. I’m sure they would freeze well and then if heated in the oven would remain crisp. Let me know how you get on. Made these for tea tonight. I fried them in tallow instead of using the oven. These were a massive hit with the whole family, thank you! Mine turned soggy & never crisped up. What did I do wrong? Did you leave the rice papers in the water too long maybe? Leave them for only a second or two to soften and once rolled up spray them with olive oil on the baking tray and turn occasionally as they are cooking. Oh, I was wondering the same thing! I am so new to this, but it’s working, so I’m out to learn all I can!! Every package I read, shows the carb count for rice paper between 50-84g. How is this considered low carb? Because that will be per 100g which is 20-30 rice papers, which equates to only a few grams of carbs each. Just choose the recipes and carbs that fit into your daily needs.